I salvaged a dining room table last year and have had grand plans of re doing it. My new place allows for such projects and my handy boyfriend came in for the assist. So excited to share the tutorial with you. 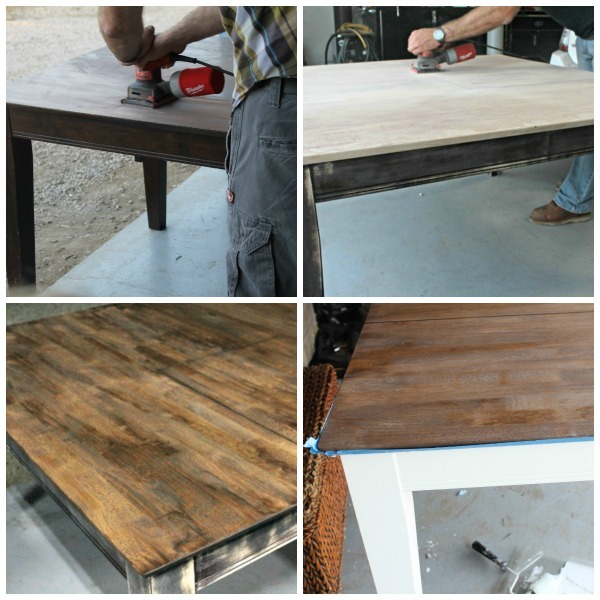 Sand the entire table with 60 grit sandpaper in the direction of the wood grain. Vacuum surface to get rid of sand residue. Continue sanding with 150 grit sandpaper, clean, and then finish with 220 grit sandpaper to get the smooth even surface. We used a air compressor to get rid of all residue before staining. We completely stripped all paint from the table top and left some original paint on the legs in case we decided to distress. Either way is fine. Using painters tape, we then taped off the perimeter of the table top to prevent the stain and paint surfaces running together. Using an old rag, we stained the top of the table again going in the direction of the wood grain. Allow to dry completely overnight. Once the stain is dry, re tape the perimeter for painting. 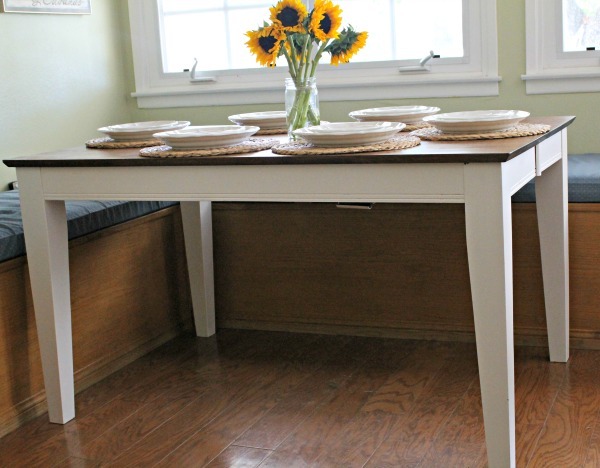 With a high quality paint brush we painted the legs of the table in Sherwin Williams “pure white” paint in satin. The quality of the brush makes a huge difference in the overall finish. Allow to dry overnight. We then applied a polyurethane sealant in semi gloss onto the table top with a padded applicator brush. 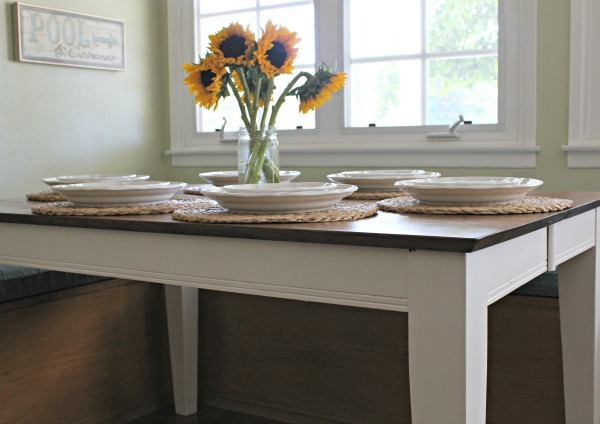 This will help preserve the overall quality of the table and protect against water stains. Allow to dry. Project complete. 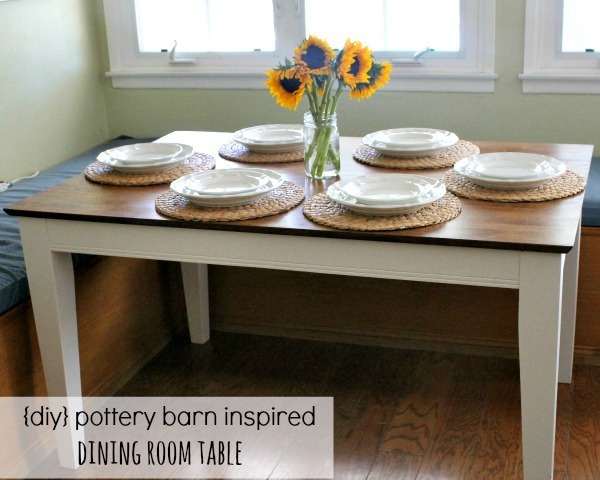 I could have gone a step further and distressed the white legs of the table for a more farmhouse look, but I fell in love with it as is. I have some chairs that I am going to re do to match next. 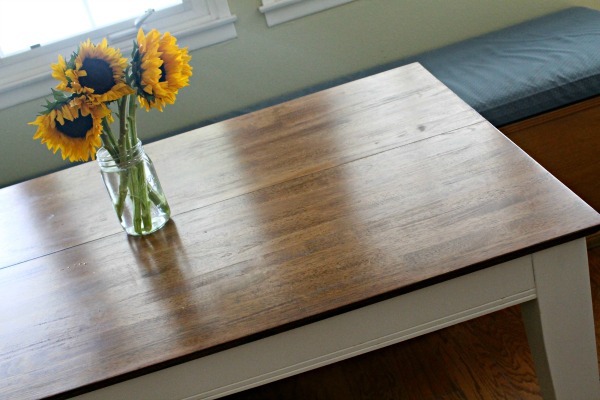 If you have an old table, this entire process can cost you under $100. Way better than the $1200 price tag on Pottery Barn’s dining tables. And I can’t finish this post without a huge thank you to Josh for all his hard work. He was out in the shop sanding and painting after work last week while I was directing and photographing. LOVE that man and his ability to bring out my creative side again. Candice, I found it at the dumpster at my old house 🙂 I saw potential! Its a super easy re do. I’d bed you could do it girl! Love it! You both did a wonderful job. Thanks for sharing. This is absolutely amazing!! You did a wonderful job, and I’m loving the sunflowers! You did a great job! I want to refurbish a piece if furniture but I hardly have time to breathe with work and school. I’m stopping by from SITS & I’m a new follower through BlogLovin. 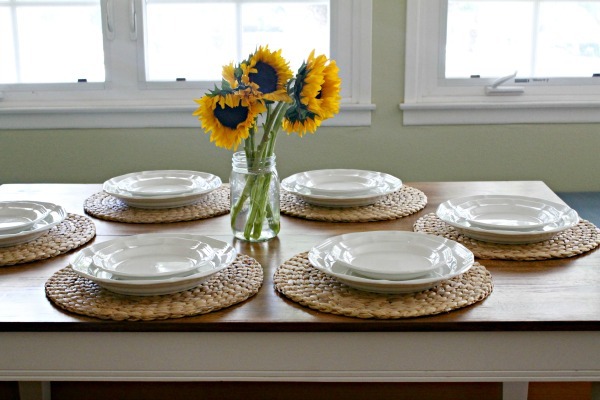 Love your table, it turned out beautifully! Great Work!! You have created a great table. It looks amazing and you have shared some great tips with all of us. This looks beautiful! Found your blog on the block party. If you like to link up come over to Craft Frenzy Friday at http://www.craftdictator.com! I hope to see you there! 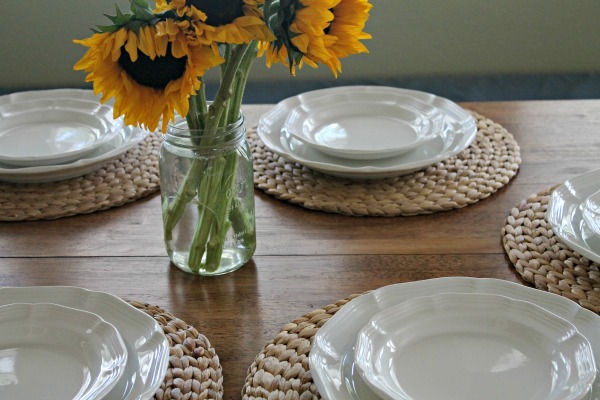 Your table turned out beautiful – a prefect combination of wood tones and white! 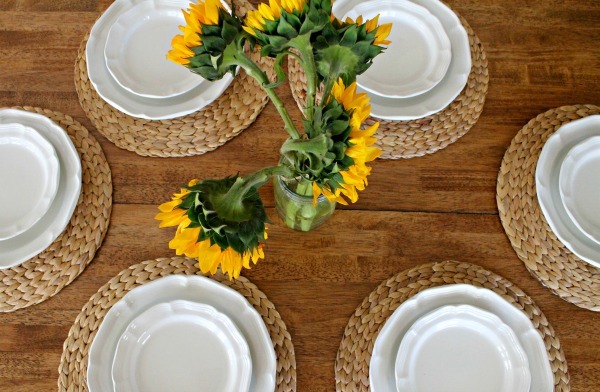 I have this linked to my DIY dining room tables post too today!